So Two Brothers calls this a Golden Ale, based off the color I’m more apt to agree with Beer Advocates American Blonde Ale. In truth the color is somewhat of a dirty golden blonde with tremendous amounts (barely avoided an overflow) of fluffy white head. It’s also slightly hazy which I’m attributing to lots of carbonation and perhaps some yeast. It smells of yeast and roasted malts with perhaps a few hints of fruity phenols as well. Tastes very light with some spicy hop flavor showing up front and center. 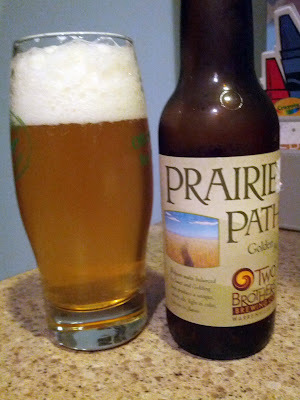 This combines with earthy yeast and more grainy roasted malt. The mouth feel is highly carbonated with a medium body. Overall an acceptable light session ale but nothing to write home about or make special trips to Chicago for. I’ll give it a 2.5/5 rating for a solid average.